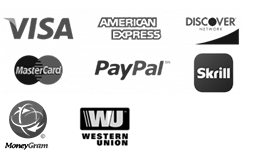 We accept PayPal, Moneybookers, Google Checkout, Western Union, Moneygram and Credit card payments. Orders are normally shipped within 1 working day. We will never hold up your order for an out of stock item. We ship worldwide. All Tooth will be packed with at most care so you buy with confidence. For 301 teeth order and more, the shipping and handling charge will be $100.